What?…Please…the Olympics are on! Don’t bother me. In fact, who on earth has time to cook when this festival of sport is filling our screen and hearts with such unknown passion? In fact, forget preparing meals, I barely have time to eat! And I have to say if you’d told me I’d feel like this a week ago, frankly I’d have laughed you out of an Olympic sized swimming pool. Put it this way, when it was pointed out today that we, the British, are very good at the ‘sitting down’ sports it occurred to me that I would be a gold medal winner several times over. This evening however, I did manage to prize myself off the sofa to make a little salad from a few things in the fridge. 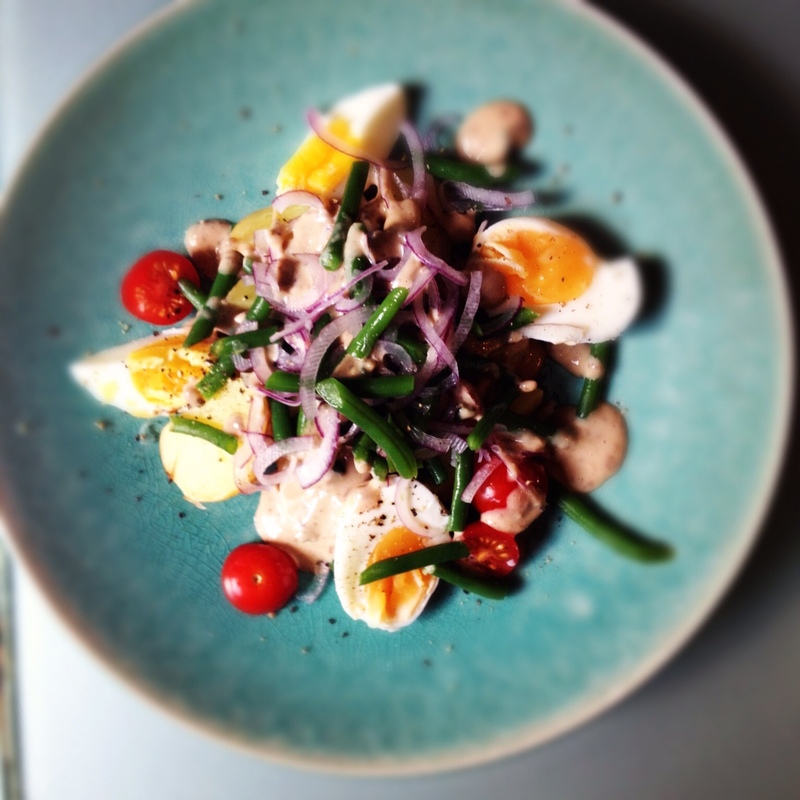 It was very much inspired by Felicity Cloake’s lovely Word of Mouth Blog in the Guardian about Salade Nicoise. This is in no way a Nicoise Salad but reading Felicity’s piece did bring on a sudden desire for anchovies, eggs and potatoes. By the way, make sure you serve the potatoes warm…it really brings the dressing to life. So without further ado, on your marks, ready, set go! WR for this salad is 10mins 15.32 seconds. 5 small Charlotte potatoes, halved for speed of cooking. First, put the potatoes on to boil in the same pan as the eggs. As they cook, top and tail the beans and cut on the diagonal. Put in a colander, cover with a pan lid and set over the simmering pan of potatoes and eggs. Finely slice the red onion and place in a small bowl. Using a ladle of water from the egg pan, cover with hot water for 30 seconds and refresh under the cold tap. Dry and set aside. The beans should be done by now so take them off and set aside. Next, make the anchoiad-y dressing. Place the anchovies, garlic, lemon juice and mayo in a mini blender and blitz for 1 seconds. If it looks a little thick, add a little cold water. After 7 minutes remove the eggs, cool in cold water, peel and quarter while the potatoes are finishing. When the potatoes are done, remove and cut into quarters while still warm.